For other uses of "voivod", "voyevoda", etc., see Voivode, Voivodes of the Polish–Lithuanian Commonwealth, and Voivode (disambiguation). This article is about the royal governors of Transylvania. For the rulers of the Principality of Transylvania after 1570, see Prince of Transylvania. The Voivode of Transylvania (German: Vojwode von Siebenbürgen; Hungarian: erdélyi vajda; Latin: voivoda Transsylvaniae; Romanian: voievodul Transilvaniei) was the highest-ranking official in Transylvania within the Kingdom of Hungary from the 12th century to the 16th century. Appointed by the monarchs, the voivodes – themselves also the heads or ispáns of Fehér County – were the superiors of the ispáns of all the other counties in the province. They had wide-ranging administrative, military and judicial powers, but their jurisdiction never covered the whole province. The Saxon and Székely communities – organized into their own districts or "seats" from the 13th century – were independent of the voivodes. The kings also exempted some Transylvanian towns and villages from their authority over the centuries. Even so, the Voivodeship of Transylvania "was the largest single administrative entity" in the entire kingdom in the 15th century. Voivodes enjoyed income from the royal estates attached to their office, but the right to "grant lands, collect taxes and tolls, or coin money" was reserved for the monarchs. Although Roland Borsa, Ladislaus Kán and some other voivodes rebelled against the sovereign, most remained faithful royal officials. Because of the gradual disintegration of the medieval Kingdom of Hungary in the 16th century, the last voivodes of Transylvania, who came from the Báthory family, ceased to be high-ranking officials. Instead they were the heads of state, although under Ottoman suzerainty, of a new principality emerging in the eastern territories of the kingdom. Accordingly, Stephen Báthory, the voivode elected by the Diet of the new realm, officially abandoned the title of voivode and adopted that of prince in 1576, upon his election as King of Poland. The origin of the office is unclear. The title voivode is of Slavic origin with a meaning of "commander, lieutenant". Although Emperor Constantine VII Porphyrogennetos wrote of the voivodes or chieftains of the Hungarian tribes around 950, he seems to have adopted the term used by a Slavic interpreter. The border position of Transylvania led to the formation of the voivodeship, since the monarchs could not maintain direct control over this remote region. Thus the voivodes were never autonomous, but remained provincial officials of the kings. The voivodes were heads of Fehér County from 1201, which may indicate that their position had its origin in the office of that county's ispán. Two royal charters issued in 1111 and 1113 mention one Mercurius "princeps Ultrasilvanus", but he may have been only an important landowner in Transylvania without holding any specific office. The title voivode was first documented in 1199, but Leustach Rátót voivode living some years earlier was mentioned by a document from 1230. In addition to voivode, royal charters used the titles banus, dux and herzog for the same office in the next decades, showing that the terminology remained uncertain until the second half of the 13th century. The territories under the jurisdiction of the voivodes are known as Voivodeship of Transylvania or Voivodate of Transylvania (Hungarian: erdélyi vajdaság, Romanian: Voievodatul Transilvaniei). Voivodes were the chiefs of the ispáns of the Transylvanian counties. Although the counties in Transylvania were first attested from the 1170s, earlier references to fortresses at their seats and archaeological finds suggest that a system of counties existed in the 11th century. For instance, Torda County was first mentioned in a charter of 1227, but a royal castle at Torda (Turda) had already been documented in 1097, and three burials coin-dated to the reign of Stephen I of Hungary (1000 or 1001–1038) were unearthed in the same fortress. The ispáns of the Transylvanian counties of Doboka, Hunyad, Kolozs, Küküllő and Torda were not listed among the witnesses of royal charters from the beginning of the 13th century, hinting that their direct connection to the monarchs had by that time been interrupted. Thereafter they were employed by the voivode who appointed and dismissed them at will. Only the heads of Szolnok County remained directly connected to the monarchs for a longer period, until their office was united with the voivodeship in the 1260s. Similarly, the voivodes were simultaneously the ispáns of the nearby Arad County between 1321 and 1412. The kings exempted some communities from the jurisdiction of the voivodes. The Diploma Andreanum, a royal charter of 1224, placed the territory of the Saxons between Broos (Szászváros, Orăștie) and Barót (Baraolt) under the authority of the Count of Hermannstadt (Nagyszeben, Sibiu), who was appointed by and directly subordinate to the monarchs. Likewise, a special royal official, the Count of the Székelys, administered the Székely community from around 1228. In the latter case, the two offices were united by custom in 1462: from then on each voivode was also appointed Count of the Székelys. Following the Mongol invasion of 1241 and 1242, King Béla IV of Hungary exempted the inhabitants of Bilak (Mărişelu), Gyalu (Gilău), Gyulafehérvár (Alba Iulia), Harina (Herina), Tasnád (Tășnad) and Zilah (Zalău). King Charles I of Hungary granted immunity to the Saxon communities of Birthälm (Berethalom, Biertan), Kleinschelken (Kisselyk, Şeica Mică), and Mediasch (Medgyes, Mediaș) in 1315, but the same monarch annulled other communities' similar privileges in 1324. Altrodenau (Radna, Rodna) and Bistritz (Beszterce, Bistrița) received immunity in 1366. The office of voivode was one of the most important royal honours in the kingdom. All income from lands attached to the Transylvanian royal castles was collected for the voivodes. They enjoyed the income from fines, but royal revenues from taxes, tolls and mines remained the kings' due. During most of the 14th century, the voivodes held the castles at Bánffyhunyad (Huedin), Boroskrakkó (Cricău), Csicsóújfalu (Ciceu-Mihăieşti), Déva (Deva), Hátszeg (Hațeg), Kőhalom (Rupea), Küküllővár (Cetatea de Baltă), Léta (Lita), Nagy-Talmács (Tălmaciu), Torja (Turia) and Újvár (Gogan Varolea), together with their lands. Additionally, the voivodes enjoyed the revenues of royal estates in Transylvania. For instance, the estates at Bonchida (Bonțida) and Vajdahunyad (Hunedoara) were attached to them for decades. However, the monarchs started to grant their castles and estates to noblemen, to the bishops of Transylvania or to the Saxon community after 1387. Consequently, Küküllővár and the lands pertaining to it remained the last piece of the "voivodal domain" in the 1450s. The inhabitants of the Transylvanian counties were compelled to accommodate the voivodes and their officials. The "guest settlers" at Boroskrakkó, Magyarigen (Ighiu) and Romosz (Romos) were the first to be released from this duty in 1206. In Alvinc (Vinţu de Jos) and Borberek (Vurpăr), the obligation itself was not abolished, but limited to two occasions a year. Finally King Charles I exempted all Transylvanian noblemen and their serfs from this irksome duty in 1324. The voivodes who preferred to stay in the royal court seldom resided in their province, but were represented by their deputies. The earliest record of a vicar of a voivode dates from 1221. Later the title "vice-voivode", first documented in 1278, came into general use. In addition to vice-voivodes and ispáns of the Transylvanian counties, the voivodes appointed the castellans of the royal fortresses. They tended to choose from among the noblemen serving in their own retinue, which ensured that their followers received a fair share of their revenues. Accordingly, when a king dismissed a voivode, his men were also replaced with his successor's men. Along with the palatine, the judge royal and the ban, the voivode was one of the Kingdom's highest judges. In this capacity, he was authorized to issue "credible" charters. The earliest preserved charter dates to 1248. The voivodes or their vice-voivodes always heard disputes together with local noblemen who knew local customs. Initially, the voivodes and their deputies held their courts at Marosszentimre (Sântimbru), but they heard disputes at their own abodes from the 14th century. Voivodes rarely headed their courts after the 1340s and were rather represented by their deputies. Although limiting his own jurisdiction, in 1342 voivode Thomas Szécsényi recognized the right of Transylvanian noblemen to judge legal cases of peasants owning parcels in their estates, "with the exception of three cases, such as robbery, highway robbery, and violent trespass". This concession was confirmed in 1365 by King Louis I of Hungary. Furthermore, the monarchs granted jus gladii (the right to the application of capital punishment) to more and more nobles in the course of the same century. According to customary law, noblemen could not be sued outside the province until the 15th century. King Louis I even prohibited all prelates and noblemen who owned lands in Transylvania from bringing legal proceedings of lesser importance concerning these estates to the royal court. Nevertheless, legal actions between Transylvanians and the inhabitants of other parts of the kingdom remained outside the jurisdiction of the voivodes. Litigants could appeal to the royal court against the decision of the voivode from the 14th century, but the voivode often remained involved in the proceedings. Legislation prescribed that appeals against decisions of the voivodes were to be addressed to the judge royal only from 1444. "Then, contempt of the general diet and the noble assembly of the Transylvanians held on the mandate of the king or of the lord voivode of Transylvania is fined by a hundred marks, amounting to the same number of florins; and that of a judicial seat, by fifty." "General assemblies" convoked and presided over by the principal judges of the realm became important judicial institutions in the last decade of the 13th century. General assemblies for the representatives of the Transylvanian counties were presided over by the voivode or the vice-voivode. The first such assembly was held on June 8, 1288. They became important legal institutions from 1322. Thereafter they were held on a regular basis, at least once a year at Keresztes (Cristiş) near Torda. With the authority of the monarch, the voivodes occasionally also invited the representatives of the Saxon and Székely communities to the counties' general meetings. This contributed to the development of legal connections among the future "Three Nations of Transylvania". The threat from the peasants' revolt of 1437 gave rise to the first joint meeting of the Hungarian noblemen and the representatives of the Saxons and the Székelys, which was convoked without a former royal authorization by the vice-voivode. Romanian cneazes were only once, in 1355, invited to the general assembly. Otherwise, the vice-voivodes organized separate meetings for them. The etymology of the title ("commander") suggests that voivodes had significant military duties. They were the supreme leader of the troops recruited in the counties under their jurisdiction. Although law obliged noblemen to fight in the king's army, Transylvanian nobles fought under the command of the voivode. Furthermore, the voivodes had their own private retinue, formed primarily by armed noblemen. Their right to raise an army under their own flag was confirmed by legislation in 1498. Military functions are attested, for instance, by Pousa, the voivode at the time of the Mongol invasion who fell in battle on March 31, 1241. Voivode Lawrence of the Aba clan fought in the royal army in a war against Austria in 1246. A Mongol army attacking the southern regions of Transylvania was defeated by voivode Ernye of the Ákos clan in 1260. Roland Borsa fought against the invading Mongols in 1285. Voivode Nicholas Csáki failed to repel an Ottoman invasion of Transylvania in 1420. In contrast, John Hunyadi, voivode between 1441 and 1446, defeated a major Ottoman army at Gyulafehérvár in 1442. His successor Stephen Báthory likewise won a resounding victory at Breadfield (Hungarian: Kenyérmező, Romanian: Câmpul Pâinii) on October 13, 1479. 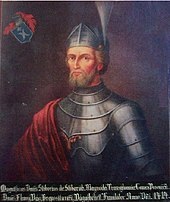 By contrast, John Zápolya (Szapolyai), the last voivode before the battle of Mohács on August 29, 1526 did not arrive to the battlefield in time, summoned too late. The battle ended with the Ottomans' annihilation of the royal army. King Louis II of Hungary was also killed on the battlefield. The voivodes had power concentrated in their hands, impelling the monarchs to replace them frequently: forty-three voivodes ruled between 1199 and 1288. Monarchs usually refrained from appointing as voivode noblemen who owned Transylvanian estates. Michael of the Kacsics clan was the first voivode to receive a land grant in the province, around 1210. However, these originally uninhabited lands along the upper courses of the river Mureș (Maros) were confiscated in 1228. The era beginning with 1288 was characterized by longer periods in office. Roland Borsa survived 10 years, while his successor, Ladislaus Kán, lasted 20 years. This apparent stability was the consequence of the weakening of central government under the last two kings of the Árpád dynasty, Ladislaus IV (1272–1290) and Andrew III (1290–1301). Royal power was only restored in the reign of Charles I (1308–1342) who one by one defeated the rebellious noblemen throughout his kingdom. In Transylvania, he was assisted by Thomas Szécsényi, the voivode between 1321 and 1342. Ioan-Aurel Pop characterizes the following period as including "voidvodal dynasties": five members of the Lackfi family (father and four sons) were successively appointed between 1356 and 1376. Likewise, Nicholas Csáki (1415 to 1426) was succeeded by his son Ladislaus. The pair preferred to entrust their vice-voivode Roland Lépes to represent them, instead of visiting the province. From the middle of the 15th century it was not unusual for two or even three noblemen to hold the office at the same time. For instance, John Hunyadi was appointed together with Nicholas Újlaki in 1441 by King Wladislas I. The Mongols comprehensively plundered the eastern territories of the Kingdom of Hungary, including Transylvania, during both their invasion in 1241 and their withdrawal the following year. The consolidation of the province was the main task of Lawrence of the Aba clan, who was appointed by Béla IV and held the office for 10 years from 1242. One of his successors, also appointed by Béla IV, banus Ernye of the Ákos clan, was dismissed in 1260 by the king's son, Stephen who had just taken over Transylvania with the title of duke. The duke's action showed emerging tensions between father and son, rather than conflicts between the duke and the banus. The first years of the reign of the minor Ladislaus IV were characterized by armed conflicts between parties of the leading noble families. Although Roland Borsa, voivode in 1282 and between 1284 and 1294, was initially among the nobles assisting the king in consolidating royal power, he himself became the source of new conflicts. First he prevented the canons of the Gyulafehérvár Chapter from collecting their income in 1289. Next he unlawfully compelled noblemen and Saxon landowners in Transylvania to accommodate him and his retinue. Later Borsa fought the bishop of Várad (Oradea) and even resisted King Andrew III who besieged him in the fortress of Adorján (Adrian) at Szalárd (Sălard) for three months in 1294. Borsa's successor Ladislaus Kán went even further by usurping royal prerogative during his voivodeship between 1294 and 1315. He arbitrarily assumed the titles of count of Bistritz, Hermannstadt and the Székelys to expand his authority over Saxon and Székely communities exempted from voivodal authority. He set up a tax-collecting body, seemingly covering the entire province. He captured Otto of Bavaria, a claimant to the Hungarian throne and seized the Holy Crown of Hungary from him in the first half of 1307. He handed the royal diadem to King Charles I in 1310, but continued to rule Transylvania de facto independently until his death in 1315. His son of the same name declared himself voivode, a title even used by the monarch when referring to him in a charter of August 12, 1315. Dózsa Debreceni, the voivode King Charles I appointed in 1318, defeated some rebellious minor lords, but royal authority in Transylvania was only restored by Thomas Szécsényi in the 1320s. The next rebellion against royal power in Transylvania broke out in 1467. Irritated by a new tax that King Matthias Corvinus had just introduced, representatives of the Three Nations concluded an alliance against the monarch and declared the three incumbent voivodes (the brothers Counts John and Sigismund Szentgyörgyi and Berthold Ellerbach) their leaders. The king put down the revolt in a week, but did not sentence the three voivodes, because their active role in the revolt was never proven. The barons did not find a compromise candidate to succeed King Louis II who perished in the battle of Mohács in 1526. First the voivode, John Szapolyai was proclaimed king by a group of nobles, but the opposing party also elected its own king, Ferdinand I, a scion of the Habsburg family, by the end of the year. King John I accepted Ottoman suzerainty in 1529, but in the Treaty of Nagyvárad of 1538 he conceded the right of the Habsburgs to succeed him after his death. At that point his voivodes, Stephen Majláth and Emeric Balassa, decided to separate Transylvania from the kingdom in order to save the province from an Ottoman invasion. Although other leading Transylvanian noblemen soon joined them, King John I overcame their rebellion in some weeks. Following John's death, Ottoman troops occupied the central parts of the Kingdom of Hungary in 1541. Sultan Suleiman I permitted the king's widow, Queen Isabella, to retain the territories east of the river Tisza (Tisa), including Transylvania, in the name of her infant son, John Sigismund. George Martinuzzi, bishop of Várad, soon started to reorganize the government in the name of the dowager queen and her son. The Ottomans assisted the bishop by capturing his opponent, Stephen Majláth, although the sultan had earlier confirmed the latter's position as voivode. An assembly of the Three Nations elected George Martinuzzi as governor on behalf of the infant king in 1542. The office of voivode was vacant until September 1549, when Ferdinand (who had not given up the idea of reuniting the territories of the entire kingdom) appointed Martinuzzi to this post. However, Isabella and his son only left their realm in 1551. Thereafter, Transylvania was again under the rule of voivodes appointed by the monarch, ending with István Dobó. He administered the province until 1556, when Isabella and John Sigismund returned. John Sigismund ceased to style himself king of Hungary after the Treaty of Speyer of 1570, under which he adopted the title of "Prince of Transylvania and Lord of parts of the Kingdom of Hungary". His successor Stephen Báthory (who was elected ruler by the assembly of the Three Nations) revived the title of voivode, initially for himself. He adopted the title of "prince of Transylvania" when he was elected king of Poland in 1576. At the same time, he conferred the title voivode on his brother Christopher in 1576. Christopher Báthory was followed in 1581 by his minor son Sigismund who continued to style himself voivode until the death of his uncle, Stephen Báthory in 1586. Sigismund Báthory's title of prince was acknowledged in 1595 by Emperor Rudolph (also king of Hungary). "Voivode of Transylvania, István Báthory! (...) Transylvania has long been under my protection, (...) and the country is my own (...). Therefore, out of my power, in accordance with your fealty to me I make Transylvania over to you." ^ a b c d e f g h i j k l m n o p Fallenbüchl 1988, p. 77. ^ a b c d e f g Zsoldos 2011, p. 36. ^ Negrău 2011, p. 92. ^ a b Jefferson 2012, p. 142. ^ a b Sedlar 1994, p. 275. ^ a b c d e Kristó 2003, p. 97. ^ Constantine Porphyrogenitus: De Administrando Imperio (ch. 38. ), p. 171. ^ a b Bóna 1994, p. 153. ^ a b c d Curta 2006, p. 355. ^ a b Rady 2000, p. 18. ^ a b c d e f g h Kristó 2003, p. 98. ^ a b c d e f g Sălăgean 2005, p. 176. ^ Curta 2006, pp. 355–356. ^ Kristó 2003, p. 90. ^ Curta 2006, p. 356. ^ Kristó 2003, pp. 90–92. ^ a b c d Pop 2005, p. 227. ^ Engel 1996, p. 246. ^ Zsoldos 2011, p. 209. ^ a b Engel 2001, p. 144. ^ a b Sălăgean 2005, p. 177. ^ Engel 1996, p. 97. ^ Makkai 1994, p. 180. ^ Sedlar 1994, p. 279. ^ a b Engel 2001, p. 115. ^ Kristó 2003, pp. 156–157., 182. ^ Kristó 2003, pp. 125., 234. ^ Makkai 1994, p. 183. ^ a b c d e Engel 2001, p. 151. ^ a b Makkai 1994, p. 200. ^ Engel 1996, p. 348. ^ Engel 1996, pp. 11, 272, 295, 299, 325–326, 338, 354, 358, 408–409, 452. ^ a b c d e Engel 1996, p. 11. ^ a b c Kristó 2003, p. 234. ^ Kristó 2003, p. 183. ^ a b c Kristó 2003, p. 222. ^ Sălăgean 2005, p. 178. ^ Rady 2000, p. 116. ^ Engel 2001, pp. 151–152. ^ a b Engel 2001, p. 152. ^ Rady 2000, p. 110. ^ a b Rady 2000, p. 69. ^ a b c Stipta 1997, p. 51. ^ a b c Mályusz 1994, p. 39. ^ a b Makkai 1994, p. 207. ^ a b Pop 2005, p. 244. ^ a b c Stipta 1997, p. 52. ^ Stephen Werbőczy: The Customary Law of the Renowned Kingdom of Hungary in Three Parts (1517) (3.3.10. ), p. 381. ^ Kristó 2003, p. 220. ^ a b c Pop 2005, p. 230. ^ Sălăgean 2005, p. 182. ^ a b c d e f Makkai 1994, p. 223. ^ Engel 1996, p. 299. ^ a b c Pop 2005, p. 246. ^ Mályus 1994, p. 29. ^ Curta 2006, p. 411. ^ a b c d e f g h i Zsoldos 2011, p. 38. ^ Kristó 2003, p. 168. ^ Makkai 1994, p. 224. ^ Pop 2005, p. 261. ^ Sedlar 1994, p. 247. ^ Makkai 1994, p. 229. ^ Engel 1996, pp. 370–371. ^ Engel 1996, p. 371. ^ Sedlar 1994, p. 398. ^ Kristó 2003, p. 223. ^ Curta 2006, p. 400. ^ Makkai 1994, p. 201. ^ a b Makkai 1994, p. 204. ^ Engel 1996, pp. 132–133. ^ Makkai 1994, p. 205. ^ Engel 1996, p. 182. ^ a b c d e Engel 1996, p. 15. ^ Engel 2001, p. 283. ^ Sălăgean 2005, p. 175. ^ Sălăgean 2005, pp. 175–176. ^ Engel 1996, p. 106. ^ a b Sălăgean 2005, p. 179. ^ Sălăgean 2005, p. 183. ^ Sălăgean 2005, p. 185. ^ Kristó 2003, p. 228. ^ Sălăgean 2005, p. 186. ^ Sălăgean 2005, pp. 186–187. ^ Sălăgean 2005, pp. 187., 188. ^ a b Kristó 2003, p. 232. ^ Engel 2001, p. 133. ^ Engel 2001, p. 302. ^ Barta 1994, p. 247. ^ a b Engel 2001, p. 371. ^ Barta 1994, p. 251. ^ Barta 1994, p. 252. ^ a b c d e f g Barta 1994, p. 253. ^ Felezeu 2009, p. 20. ^ Felezeu 2009, p. 19. ^ Barta 1994, p. 256. ^ Barta 1994, pp. 259–260. ^ a b c Barta 1994, p. 263. ^ a b Barta 1994, p. 294. ^ Engel 2001, pp. 35., 381. ^ a b c d e f g h i j k l m n o p q r s t u v w x y Treptow, Popa 1996, p. lvi. ^ a b c d e f g h i j k l m n o p q r s Engel 2001, p. 381. ^ a b c Markó 2000, p. 291. ^ a b c d e f g h i j k l m n o Zsoldos 2011, p. 37. ^ a b Markó 2000, p. 283. ^ Engel 2001, pp. 90., 381. ^ a b c d e f g h i j k l m n o p q r s t u v w x y z Engel 2001, p. 382. ^ Markó 2000, p. 254. ^ a b c d Zsoldos 2011, pp. 38., 209. ^ a b c d e f g h i j k l m n o p q r s t u v w x y z aa ab ac ad ae af ag ah ai aj ak al am an Treptow, Popa 1996, p. lvii. ^ a b c d e f g h i j k l Zsoldos 2011, pp. 39., 209. ^ Markó 2000, p. 207. ^ a b c d e Zsoldos 2011, pp. 40., 209. ^ Engel 1996, pp. 11., 200. ^ a b c d e f g h i j k l m n o p q r s t Engel 2001, p. 383. ^ a b c d e f g h Engel 1996, pp. 11–12. ^ a b c d e Engel 1996, pp. 182., 383. ^ a b c d Markó 2000, p. 287. ^ a b c d e f g h i j Engel 1996, pp. 11., 13. ^ a b c d Markó 2000, p. 288. ^ a b c Markó 2000, p. 284. ^ Markó 2000, p. 289. ^ a b c Engel 1996, pp. 11., 14. ^ a b c d Engel 1996, p. 14. ^ a b c d e f g h i j k l m n o p q r s Treptow, Popa 1996, p. lviii. ^ a b c d e f g h Engel 2001, p. 384. ^ Markó 2000, pp. 282–283. ^ a b Markó 2000, p. 286. ^ Markó 2000, p. 275. ^ Markó 2000, pp. 291–292. ^ Markó 2000, pp. 291., 294. ^ Markó 2000, p. 285. ^ a b Markó 2000, pp. 278., 293. ^ Markó 2000, pp. 288–289. ^ Markó 2000, pp. 283–285. ^ Markó 2000, p. 278. ^ Markó 2000, pp. 290–291. ^ Markó 2000, pp. 287–288. ^ a b Markó 2000, p. 282. ^ Markó 2000, p. 256. ^ Barta 1994, pp. 260, 263. ^ Barta 1994, pp. 263., 294–295. Stephen Werbőczy: The Customary Law of the Renowned Kingdom of Hungary in Three Parts (1517) (Edited and translated by János M. Bak, Péter Banyó and Martyn Rady with an introductory study by László Péter) (2005). Charles Schlacks, Jr. Publishers. ISBN 1-884445-40-3. Barta, Gábor (1994). "The Emergence of the Principality and its First Crises (1526–1606)". In: Köpeczi, Béla (editor), History of Transylvania. Akadémiai Kiadó. ISBN 963-05-6703-2. Bóna István (1994). "The Hungarian – Slav Period (895–1172)". In: Köpeczi, Béla (editor) History of Transylvania. Akadémiai Kiadó. ISBN 963-05-6703-2. (in Hungarian) C. Tóth, Norbert; Horváth, Richárd; Neumann, Tibor; Pálosfalvi, Tamás (2016). Magyarország világi archontológiája, 1458–1526, I. Főpapok és bárók [Secular Archontology of Hungary, 1458–1526, Volume I: Prelates and Barons] (in Hungarian). MTA Bölcsészettudományi Kutatóközpont Történettudományi Intézete. ISBN 978-963-4160-35-9. (in Hungarian) Engel, Pál (1996). Magyarország világi archontológiája, 1301–1457, I. ("Secular Archontology of Hungary, 1301–1457, Volume I"). História, MTA Történettudományi Intézete. Budapest. ISBN 963-8312-44-0. (in Hungarian) Fallenbüchl, Zoltán (1988). Magyarország főméltóságai ("High Dignitaries in Hungary"). Maecenas Könyvkiadó. ISBN 963-02-5536-7. Felezeu, Călin (2009). "The International Political Background (1541–1699)". In: Pop, Ioan-Aurel; Nägler, Thomas & Magyari, András, The History of Transylvania, Vol. II. (From 1541 to 1711). Romanian Academy, Center for Transylvanian Studies. ISBN 978-973-7784-43-8. Kristó, Gyula (2003). Early Transylvania (895–1324). Lucidus Kiadó. ISBN 963-9465-12-7. Makkai, László (1994). "The Emergence of the Estates (1172–1526)". In: Köpeczi, Béla (editor), History of Transylvania. Akadémiai Kiadó. ISBN 963-05-6703-2. Mályusz, Elemér (1994). "Hungarian nobles of medieval Transylvania". In: Bak, János M., Nobilities in Central and Eastern Europe: Kinship, Property and Privilege. Hajnal István Alapítvány & Medium Aevum Quotidianum Gesellschaft. ISBN 963-04-2014-7. (in Romanian) Negrău, Elisabeta (2011). Cultul suveranului sud-est european şi cazul Ţării Româneşti: O perspectivă artistică [=The Southeastern European Sovereigns' Cult in the Case of Wallachia: An Artistic Approach]. Lumen. ISBN 978-973-166-274-9. Pop, Ioan-Aurel (2005). "Romanians in the 14th–16th Centuries: From the 'Christian Republic' to the 'Restoration of Dacia'". In: Pop, Ioan-Aurel & Bolovan, Ioan, History of Romania: Compendium. Romanian Cultural Institute (Center for Transylvanian Studies). ISBN 978-973-7784-12-4. Rady, Martyn (2000). Nobility, Land and Service in Medieval Hungary. Palgrave (in association with School of Slavonic and East European Studies, University College London). ISBN 0-333-80085-0. Sălăgean, Tudor (2005). "Romanian Society in the Early Middle Ages (9th–14th Centuries AD)". In: Pop, Ioan-Aurel & Bolovan, Ioan, History of Romania: Compendium. Romanian Cultural Institute (Center for Transylvanian Studies). ISBN 978-973-7784-12-4. (in Hungarian) Stipta, István (1997). A magyar bírósági rendszer története ("History of the Hungarian Judicial System"). Multiplex Media-Debrecen University Press. ISBN 963-04-9197-4. Szegedi, Edit (2009). "The birth and evolution of the Principality of Transylvania (1541–1690)". In: Pop, Ioan-Aurel; Nägler, Thomas & Magyari, András, The History of Transylvania, Vol. II. (From 1541 to 1711). Romanian Academy, Center for Transylvanian Studies. ISBN 978-973-7784-43-8. Treptow, Kurt W. & Popa, Marcel (1996). Historical Dictionary of Romania. Scarecrow Press, Inc. ISBN 0-8108-3179-1. (in Hungarian) Zsoldos, Attila (2011). Magyarország világi archontológiája, 1000–1301 ("Secular Archontology of Hungary, 1000–1301"). História, MTA Történettudományi Intézete. Budapest. ISBN 978-963-9627-38-3. Pop, Ioan-Aurel; Nägler, Thomas; Bărbulescu, Mihai; Dörner, Anton E.; Glodariu, Ioan; Pop, Grigor P.; Rotea, Mihai; Sălăgean, Tudor; Vasiliev, Valentin; Aldea, Bogdan; Proctor, Richard (2005). The History of Transylvania, Vol. I. (Until 1541). Romanian Cultural Institute (Center for Transylvanian Studies). ISBN 973-7784-00-6. (in French) "La Transylvanie dans l'Etat hongrois médiéval (895–1526)"
(in German) "Siebenbürgen im mittalterlichen Königreich Ungarn"